Our home needs to be well fitted with the right furniture sets so that when you or your guest comes in, they feel relaxed and comfortable. Although choosing the right furniture for the interior is fairly easy, when it comes to furniture for outdoors, it becomes more of a challenge. 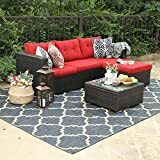 Houses with an open backyard, patio, or courtyard deserve to have a place to sit and hence beautifying it with the patio sofas is a great choice. These sofas are constructed with a different approach as they will be more exposed to open weather always. No matter the weather conditions, the sofas stay outside hence choosing something that will last is very important. Along with the durability, you also need the comfort to be top notch as more often than not you will relax here. 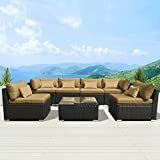 Check out the best patio sofas for sale which you can make your days all the more relaxing and dun. These are selected on the basis of the comfort they deliver and also the reliability in the long run. Humans feel the need for relaxation every now and then; hence our homes are always well equipped with comfortable beds as well as sitting arrangements. 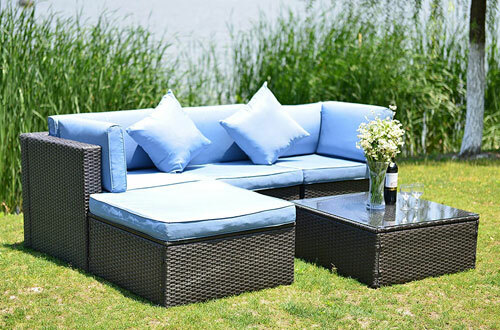 The patio sofas with storage are beautiful that certainly make the home all the more attractive. 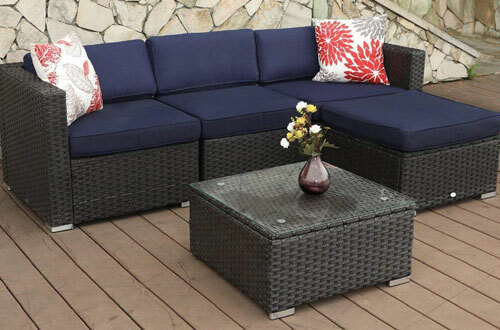 This 4 piece sofa set is designed with thick wicker cushioning for unparallel comfort. Moreover, the legs are constructed out of sturdy materials to maintain the beauty of the flooring while keeping it safe always. Along with that, the powder coated steel frame is extremely strong and durable. 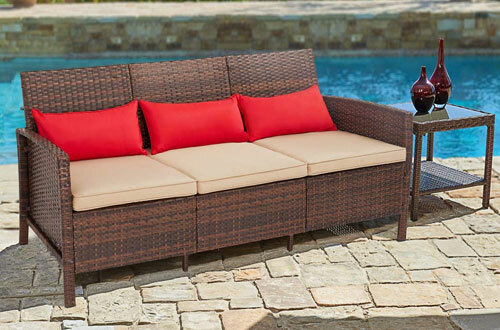 The all-weather PE rattan wicker used in the exterior makes the sofa ideal for your backyard or porch. Having a rebound sponge that is of high-density, it is cushiony and have extra storage options. The tempered Glass table is strong and guarantees a long life. Removable seat cushion helps in maintaining the cleanliness. UV proof product that has a space saving design. 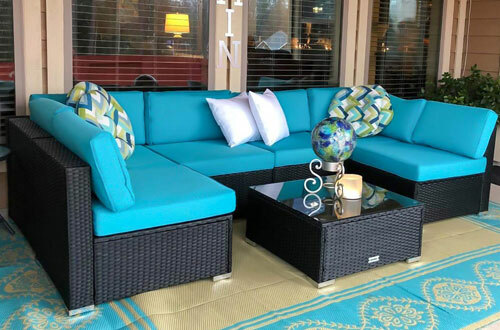 A tufted classic patio sofa that comes in an alluring finish and high-end construction makes a perfect addition to your home that you would love to show to your guests. On the outside, you get a high-performance upholstery with a timeless design and equally durable for long years of service. The entire frame is made out of solid plus engineered hardwood, making it very sturdy and stable. Along with that, the beauty has a touch of classic design refreshed with modern styling. All you need to do is attach the legs and the sofa is all ready to entertain you and your guests. And the nylon/polyester fabric complements it plush finish. Features an extra-wide seating frame for more comfort. Uses high-density foam for more life and service. Reversible covers are easy to maintain and are long-lasting. 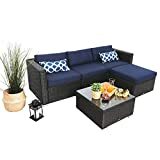 One of the best looking outdoor wicker patio sofas in the market, the Solarua sofa set is a perfect example of luxury styling at the lowest possible size. It has a very compact size that lets you have all the fun in the sun without taking up too much space in your backyard. The rich brown weatherproof wicker used on the sofa is hand woven, thus, making it more comfortable. When you sport it with the gold stripe throw pillows, the sofa looks extremely appealing. Also, Solarua has designed the sofa to be extra comfortable and thus features extra-wide seats perfect for 3 people seating comfortably. Further, the ergonomically designed frame feels plush while the sponge padded cushion ensures you feel at your best when relaxing. Comes with strong and easy to clean olefin outdoor fabric. Constructed of olefin outdoor fabric. Has complex weave patterns making the safe extremely sturdy and durable. It is a premium looking sofa set that allows comfortable seating of three people and one will not feel any problem. The classic yet sophisticated looking weaved wicker effectively stands out and appeals to every person. 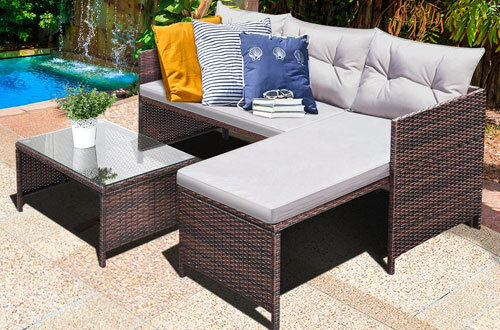 Furthermore, the sofa has an all-weather resin coating on the outside making it an ideal outdoor sofa set for any weather whatsoever. Instead of having an open-back weave, it is still easy to maintain. Bring home the best of classic styling combined with modern looks and finish that readily elevates the overall decor of your house. Maximum 30 to 60 minutes of assembly time. Comes with thick cushions for more comfort and strength. Can be set up in any given style of living space. When it comes to sofas for patios, looks play a very important role along with the functionality and durability of the sofa. This 7 pieces sleek looking option is very appealing to the eyes and features a very modern styling as well. 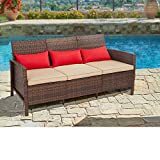 As it has a very different approach in terms of design, the PE rattan wicker patio sofa can also double up as a perfect sitting arrangement inside the house. In addition to the top-notch styling, the sofa has a very strong steel frame which will last you longer years without causing any troubles whatsoever. 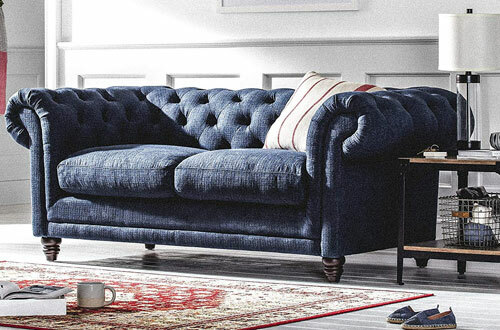 Along with the high-end construction and styling, the sofa comes with machine washable fade resistant cushions which are easy to clean and maintain the amazing looks always. Seat cushions have breathable feature, making them more comfortable. Strong yet lightweight wicker is used for the construction of the sofa. This UV resistant product is generously padded with a sponge. When this sofa sits beautifully in your courtyard, your guests will be amazed to see that how fashionable it looks. The classic dark shade combined with a tinge of red raises the appeal surprisingly and everyone who visits you would love the outdoors more. They have a very elegant and modular look which you can customize the way you want. Besides, these are coupled with 3.4” of thick cushions that are resistant against slipping, fading, and even water. Furthermore, the cushions have zippered design and are safe to wash in a machine without any worries. No matter how much space you have in outdoors, it will look really modern and classy. Upgraded locknut design enhances the stability of the sofa. Comes packed with all accessories needed for installation. PE rattan is hand woven and safe against all weather. Include this outstanding sofa set from the brand Tangkula and forget all the worries related to sitting arrangements on the outside. As it is made of a high-quality steel frame and topped with PE wicker, it means longer life, more stability and effortless handling. Furthermore, everything on the set is resistant to rusting and weather elements. As these are all weather safe, you need not to worry about the unpredictable rains. Also, you get a table with 5mm thick tempered glass that goes well with the patio sofa set. In addition to that, the comfortable cushioning of the sofa is made of 25D sponge and polyester. PP cotton back cushions are extremely comfortable and help you relax. Easy to clean seat cushion. Zippered cushions let you replace when you feel the need. Yet another brilliant model from the house of PH Villa, this sectional patio sofa is fashionable in the way it looks and functions just the way you want. 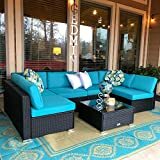 It comes fitted with high-density foam that will reward you with a supreme level of comfort while the spun cushion covers are zippered and easy to keep clean. 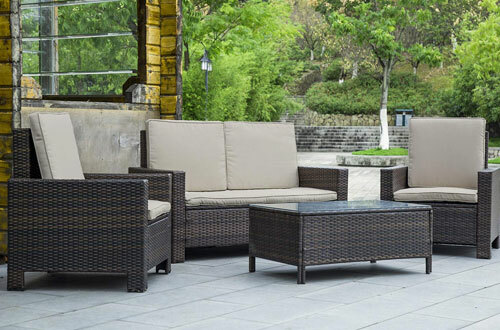 Along with that, you will get a steel frame construction that is safe against rusting combined with a PE rattan suited for any kinds of weather. 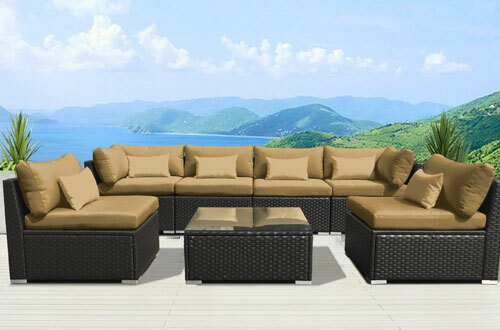 When you own this modern looking sofa set and place it in the outdoors, your guests will envy you before they even enter your house. Plus, the sturdy crossbar maintains the bearing capacity and improves stability. You can customize your arrangements and set it any way you want. Comes with clips to keep every part connected. Can be washed in a machine. 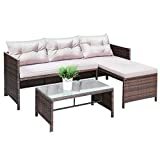 If you are keen on elevating the decor of your outdoors and also want to transform your boring garden into a place of perfect relaxation, get this ultra modern and workable sofa set. Firstly, the 5 piece set that includes everything you would want in and around a sofa. With an amazing weight capacity of 350 pounds, no matter how much weight it is exposed to, the sofa will last. In terms of comfort, the thick padded cushions are really relaxing and have a zippered opening for cleaning whenever you feel the need. Having structural integrity as well modular versatility, it makes use of premium sponge that is multi-layered and is both rustproof as well as anti-UV. Multiple configuring options make the sofa more flexible. Steel frame construction for added sturdiness. 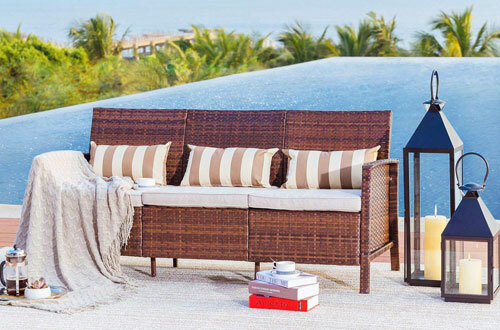 PE wicker rattan is hand woven and protected against rain, snow, and wind. 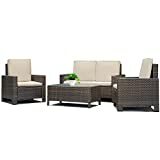 The top product, this set is the largest and is a 7 piece set to accommodate large amounts of people comfortably. Along with the sofas, you will get a coffee/tea table which is finished with a durable tempered glass table top. The Modenzi sofa set is comfortable as well and has 4” thick cushions in the seat. With the zippered cushions, whenever you feel they are dirty you can just clean them with ease. Moreover, the PE wicker has an appealing espresso brown colour and has resin coating for total protection against different types of weather. Sturdy yet very lightweight, letting you move it with ease. Available in 9 different types of cushion colours. The aluminium patio sofa frame is further enhanced by powder coating. Turn your patio into a lively place where you can hang out with your friends or self. 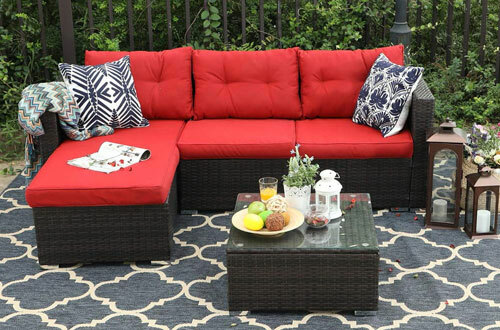 Install a patio table sofa set for having the best seating arrangements.